The good news...Mexico City just inaugurated the first 11 mile stretch of "ciclopista" (freeways are called "autopista")...with a total of 50 miles currently in the works. Cycle enthusiasts (and bike coalition groups) expect this to be the first stage of a wide spread network of badly needed bike and pedestrian paths, for the world's most populated city. The past decades have seen the automobile take center stage, and the hope is to reverse the troubling trend. As the success of the "ciclopista" becomes evident, smaller cities and towns throughout Mexico are expected to follow the capitol's lead. However, it's unfortunate to note...work is also being undertaken on the new "segundo piso autopista" (double decker freeway), with some saying the bike path was meant to appease those resisting increased numbers of private automobiles in a most congested, perhaps worst air quality city in the world. (more on this subject below, from a recent LA Times article). For an update on what Electroportal hopes to accomplish this year, we hope you'll follow the link below. 1 less car in "SmogCity"
- The project allows some relief from gridlock. The problem may be the route's popularity. MEXICO CITY - Jose Luis Piñeda, a motorcyclist with nerves of steel, earns a living zig-zagging through Mexico City's nightmare traffic. But last week the 32-year-old deliveryman found himself cornered. Four irate cyclists surrounded Piñeda, bringing his Yamaha 100 to a halt. "You are trespassing in a bicycle lane," declared Roberto Cruz, looking authoritative in a brown suit and tie. "You deserve a fine. We are going to fine you." The motorcyclist looked shaken. He pointed to a nearby bank awaiting his cargo of printer paper. "Let me finish my trip," he pleaded. The cyclists laughed and handed him a mock ticket, depicting a burro obstructing a road. "Terrible manners!" it read. Then Ricardo Salas, the "good cop" of the group, waved the intruder on. "No problem," Salas said. "But next time, come back on a bike. You will be welcome." The object of this turf battle - an 11-mile strip of brick-red concrete that cuts across clogged expressways and loops through leafy Chapultepec Park - was inaugurated Sunday, giving the lowly bicyclist some officially sanctioned elbow room amid the chaos on wheels that defines Latin America's largest city. Mayor Andres Manuel Lopez Obrador agreed to the $10-million project to console environmentalists who had unsuccessfully challenged his $270-million project to untangle the city's gridlock by adding a second story to each of its two busiest highways. "We all agree on the need to create a different way of living together in this city," the mayor told several hundred cyclists lined up to flood the bike lanes after his wave of a checkered flag. La Ciclopista is due to expand this year to a length of 50 miles. But as the showdown with the Yamaha suggests, the new network is only a tentative advance for cyclists - one they feel hard-pressed to defend. Who in their right mind, you might wonder, would want to venture out on a bicycle here? This is a city where 2.7 million private cars wage mortal combat with thousands of taxis, trailer trucks and, worst of all, minibuses that weave in and out of traffic with no fixed stops. On three days out of five, the air registers unsafe levels of ozone. Yet tens of thousands of people here commute to work or school on bikes, or pedal entire shifts delivering newspapers, pizzas, milk, tacos, dry cleaning and mail. Until Sunday, they had been losing ground to the automobile. "We would rather have a city without cars, but today at least we are recovering part of the street and gaining some respect," said Leon Hamui, a 47-year-old construction executive who cycles on the job and lobbied the mayor for bike lanes. He added: "These lanes are not enough by themselves. Until they become part of a citywide network, we cannot civilize the culture of the car." Hamui and three other members of Bicitekas, the 400-member cycling club he heads, accompanied a reporter and photographer on a pre-inaugural tour of the bike circuit last week to point out its advantages and limitations. 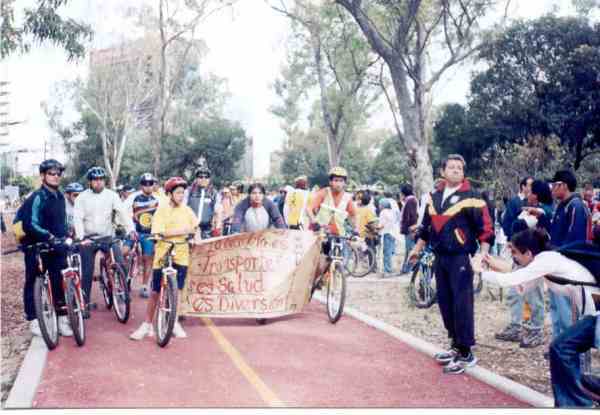 The main route, lined with saplings and patrolled by cops on bicycles, parallels part of the 10-lane Periferico ring road between Ejercito Nacional and the Viaducto Miguel Aleman along an abandoned rail line that City Hall acquired and reserved for bikes. Cycling bridges soar over five busy crossings. Along protected parts of that stretch, you can fly past bumper-to-bumper traffic and feel immensely superior - if you can stand the exhaust. But at four level crossings, you are humbled again - obliged to stop, fight across unimpeded traffic and endure shouts of "Lousy cyclists!" On the loops in Chapultepec Park, police tow trucks have discouraged motorists from parking in the bike lane. Even so, you can often find the lane blocked by a tour bus or a water truck spraying the park's shrubbery. It could get worse. Last month, a drunk driver who identified himself as a nephew of the city's police chief crashed his Mercedes-Benz through a protective barrier on the Periferico and spun to a halt in the bike lane. No one was hurt. The biggest challenge to cyclists in the lanes has come not from cars but from pedestrians. One office towers has become a busy corridor for people walking to and from work or strolling on their lunch hour. The path is 10 feet wide there, not enough to accommodate cyclists and pedestrians in both directions. Among those who poured into the bike lanes Sunday were pedestrians pushing baby carriages, walking dogs, running and dribbling basketballs. Thrill seekers hurtled down the dauntingly steep ramps of the cycling bridges on skates and non-motorized scooters. Some cyclists opposed the bike lanes because the project would channel bikes and pedestrians into the same off-road space. Residents of Condesa rejected an extension of the lanes from the park into their pedestrian-friendly neighborhood. "The bike lanes were built to get us off the street," said Carlos Garcia-Robles, 29, a member of Bicitekas. "My bike lane is the street. The street was not made only for cars." But 80% of the city's residents who were asked approved of bike lanes, and 64% said they would use them, according to a poll last month in the newspaper Reforma.